Expansion Cards provide you with a way to add hardware to your RISC OS computer. They plug into slots provided in the computer, typically in the form of a backplane (these are an optional extra on some models). Extension ROMs are ROMs fitted in addition to the main ROM set, which provide software modules which are automatically loaded by RISC OS on power-on. Note that RISC OS 2 does not support extension ROMs. Extension ROMs are provided so that Acorn can add extra modules to RISC OS, or provide replacement modules for those already in RISC OS. You must not use them. This chapter gives details of the software that RISC OS provides to manage and communicate with expansion cards. It also gives details of what software and data needs to be provided by expansion cards for RISC OS to communicate with them; in short, all you need to know to write their software. For completeness, it gives the same information for extension ROMs; but - of course - this is irrelevant to you, as you shouldn't use extension ROMs. The two topics are covered together because both use substantially the same layout of code and data, and the same SWIs. For more details on writing modules, see the chapter entitled Modules. Instead, you should see the further sources of information to which we refer you. RISC OS computers can support internal slots for expansion cards. If you wish to add more cards than can be fitted to the supplied slots, you must use one of the slots to support an expansion card that buffers the signals on the expansion card bus before passing them on to external expansion cards. Some RISC OS computers can also support extension ROMs. The availability, size and number of extension ROM sockets depends on which type of RISC OS computer you are using. For example, the A5000 has a single socket for an 8 bit wide ROM. A wide range of different types of code and data is supported by the Chunk Directories. The use of the Loader and paged memory has been made as transparent to the end user as possible. a Chunk Directory, that defines what each part of the ROM's memory space is used for (see Chunk directory structure). In general, RISC OS recognises extension ROMs or ROM sets which are 8, 16 or 32 bits wide, provided the ROM adheres to the specification below. 32 bit wide extension ROM sets are directly executable in place, saving on user RAM. 8 or 16 bit wide sets have to be copied into RAM to execute. An extension ROM set must end on a 64K boundary or at the start of another extension ROM. This is normally not a problem as it is unlikely you would want to use a ROM smaller than a 27128 (16K), and the normal way of addressing this would mean that the ROM would be visible in 1 byte out of each word, ie within a 64K addressable area. Extension ROMs must have a 16 byte Extension ROM Header at the end of the ROM image, which indicates the presence of a valid extension ROM. The 'header' is at the end because RISC OS scans the ROM area downwards from the top. Note that this header will not necessarily appear in the memory map in the last 16 bytes if the ROM set is 8 or 16 bits wide. In the 8-bit case, the header will appear in one of the four byte positions of the last 16 words, and in the 16-bit case, in one of the two half-word positions of the last 8 words. However, RISC OS copes with this, and uses the mapping of the ID field into memory to automatically derive the width of the extension ROM. an extended ECId of eight bytes, which may be followed by other information (see Extended Expansion Card Identity). The ECId (whether extended or not) must appear at the bottom of the expansion card space immediately after a reset. However, it does not have to remain readable at all times, and so it can be in a paged address space so long as the expansion card is set to the page containing the ECId on reset. The ECId is read by a synchronous read of address 0 of the expansion card space. You may only assume it is valid from immediately after a reset until when the expansion card driver is installed. As well as the Extension ROM header at the end of the ROM image, Extension ROMs must also have a header at the start of the ROM image. This header is identical in format to an Extended Expansion Card Identity, and is present for the use of the Expansion Card Manager, which handles much of the extension ROM processing. See Extended Expansion Card Identity onwards, paying particular attention to the Mandatory values for extension ROMs. Expansion cards can use a simple ECId, which is one byte long. You should only use one for the very simplest of expansion cards, or temporarily during development. Most expansion cards should instead implement the extended ECId, which eliminates the possibility of expansion card IDs clashing. Extension ROMs must use an extended ECId, rather than a simple ECId. If you do use a simple ECId, your expansion card must be 8 bits wide. The only operations that you may perform on its ROM are Podule_RawRead (see Podule_RawRead) or Podule_RawWrite (see Podule_RawWrite). This bit must be zero for expansion cards that conform to this Acorn specification. If you are using a simple ECId, the four ID bits may be used for expansion card identification. They must be non-zero, as a value of zero shows that you are instead using an extended ECId. The interrupt status bits are discussed below in the Generating interrupts from expansion cards. This must be zero, as shown above. For more information, see the chapter entitled Expansion card and extension ROM presence. An expansion card's ECId is extended if the ID field of its ECId low byte is zero. This means that RISC OS will read the next seven bytes of the ECId. The extended ECId starts at the bottom of the expansion card space, and consists of the eight bytes defined below. If an expansion card has an extended ECId, the first 16 bytes of its address space are always assumed to be bytewide. These 16 bytes contain the 8 byte extended ECId itself, and a further 8 bytes (typically the Interrupt status pointers - see below). If the ECId is included in a ROM which is 16 or 32 bits wide, then only the lowest byte in each half-word or word must be used for the first 16 (half) words. if you are using the 32 bit wide mode, you should use word load and store instructions. Synchronous cycles are used by the operating system to read and write any locations within this space (to simplify the design of synchronous expansion cards). the current version of the RISC OS Expansion Card Manager only supports the 8 bit wide mode; future versions may support the wider modes. Every expansion card should have a code for the country of origin. These match those used by the International module, save that the UK has a country code of 0 for expansion cards. If you do not already know the correct country code for your country, you should consult Acorn. Every expansion card should have a code for manufacturer. If you have not already been allocated one, you should consult Acorn. Every expansion card type must have a unique number allocated to it. Consult Acorn if you need to be allocated a new product type code. Reserved fields must be set to zero to cater for future expansion. This field must currently be set to zero (expansion card is 8 bits wide). For more information, see the earlier Expansion card width. See the sections entitled Generating interrupts from expansion cards, and Interrupt Status Pointers. See the chapter entitled Chunk directory structure. If you are using an extended ECId, these bits must be zero, as shown above. A non-zero value shows that you are instead using a simple ECId; for more information see ID field (ID [3:0]). The section entitledinterrupt status bits are discussed below in the Generating interrupts from expansion cards. An extension ROM must include an extended ECId. This starts at the bottom of the ROM image, and consists of eight bytes as defined above. The product type code must be &87 (ie the product type is an extension ROM). The width field must always be 0 (8 bits wide), irrespective of the ROM's actual width, which RISC OS automatically derives (see the chapter entitled Extension ROM width). Both the Interrupt Status Pointer field and the Chunk Directory field must be 1, showing the ECId is followed by Interrupt Status Pointers, then by a Chunk Directory. The Acorn conformant field must be 0, to show that the extension ROM is Acorn conformant. The interrupt status bits (FIQ and IRQ) must both be clear, to show that the extension ROM is not requesting an interrupt. All expansion cards and extension ROMs must have bit 1 low in the low byte of an ECId (whether simple or extended), so that RISC OS can tell if there are any of them present. If no expansion card is present and RISC OS tries to read the ECId low byte, bit 1 will be set. If an expansion card is present, and the ECId is mapped into memory (which it must be immediately after a reset), the bit will instead be clear. Expansion cards must provide two status bits to show if the card is requesting IRQ or FIQ. 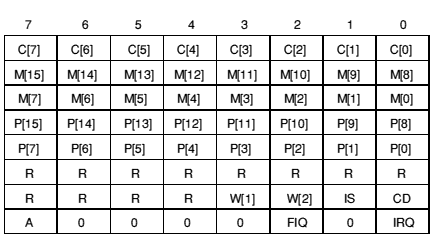 If an expansion card only has a simple ECId, then the FIQ and IRQ status bits are bits 2 and 0 respectively in the ECId. If the card does not generate one or both of these interrupts then the relevant bit(s) must be driven low. you want to relocate the interrupt status bits from the low byte of the ECId. If neither of the above apply, then you can omit the Interrupt Status Pointers. The interrupt status bits are located in the low byte of the ECId, and are treated in exactly the same way as for a simple ECId (see above). see the chapters entitled ARM Hardware and Interrupts and handling them. consult the Acorn RISC Machine family Data Manual. VLSI Technology Inc. (1990) Prentice-Hall, Englewood Cliffs, NJ, USA: ISBN 0-13-781618-9.
contact Customer Support and Services for further hardware-specific details. The 24-bit address field must contain a signed 2's-complement number giving the offset from &3240000 (the base of the area of memory into which podules are mapped). Hence the cycle speed to access the status register can be included in the offset (encoded by bits 19 and 20). Bits 14 and 15 (that encode the slot number) should be zero. If the status register is in module space then the offset should be negative: eg &DC0000, which is -&240000. The 8-bit position mask should only have a single bit set, corresponding to the position of the interrupt status bit at the location given by the address field. Note that these eight bytes are always assumed to be bytewide. Only the lowest byte in each word should be used. The addresses may be the same (ie the status bits are in the same byte), so long as the position masks differ. An example of this is if you have had to provide an Interrupt Status Pointer, but do not want to relocate the status bits from the low byte of the ECId; the address fields will both point to the low byte of the ECId, the IRQ mask will be 1, and the FIQ mask will be 4.
the corresponding status bit(s) in the low byte of the ECId. Extension ROMs must have a Chunk Directory, hence they must also provide Interrupt Status Pointers. However, extension ROMs generate neither FIQ nor IRQ; consequently their Interrupt Status Pointers always consist of eight zero bytes. a directory of Chunks follow the Interrupt Status Pointers. The chunks of data and/or code are stored in the expansion card's ROM, or in the extension ROM. The lengths and types of these Chunks and the manner in which they are loaded is variable, so after the eight bytes of Interrupt Status Pointers there follow a number of entries in the Chunk Directory. The Chunk Directory entries are eight bytes long and all follow the same format. There may be any number of these entries. This list of entries is terminated by a block of four bytes of zeros. The start address is an offset from the base of the expansion card's address space. Those Chunks with OS[2:0] = 7, are operating system independent and are mostly treated as ASCII strings terminated with a zero byte. They are not intended to be read by programs, but rather inspected by users. It is expected that even minimum expansion cards will have an entry for D[3:0] = 5 (description), and it is this string which is printed out by the command *Podules. For a ROM to be read by the Expansion Card Manager it must conform to the specification, even if only minimally. The simplest way to generate ROM images is to use a BASIC program to combine the various parts together and to compute the header and Chunk Directory structure. An example program used with an expansion card is shown at the end of this chapter. Its output is a file suitable for programming into a PROM or an EPROM. The above forms the basis of storing software and data in expansion cards. However, there is an obvious drawback in that the expansion card space is only 4 Kbytes (at word boundaries), and so its usefulness is limited as it stands. To allow expansion cards to accommodate more than this 4 Kbytes an extension of the addressing capability is used. This extension is called the Code Space. The Code Space is an abstracted address space that is accessed in an expansion card independent way via a software interface. It is a large linear address space that is randomly addressable to a byte boundary. This will typically be used for driver code for the expansion card, and will be downloaded into system memory by the operating system before it is used. The manner in which this memory is accessed is variable and so it is accessed via a Loader. The purpose of the Loader is to present to the Expansion Card Manager a simple interface that allows the reading (and writing) of the Code Space on a particular expansion card. The usual case is a ROM paged to appear in 2 Kbyte pages at the bottom of the expansion card space, with the page address stored in a latch. This then permits the Expansion Card Manager to load software (Relocatable Modules) or data from an expansion card without having to know how that particular expansion card's hardware is arranged. The Loader is a simple piece of relocatable code with four entry points and clearly defined entry and exit conditions. The format of the Loader is optimised for ease of implementation and small code size rather than anything else. The register usage is the same for each of the four entry points. The exception to this is the CallLoader entry point where R0 - R2 are the user's entry and exit data. All code must be relocatable and position independent. It can be assumed that the code will be run in RAM in SVC mode. The first call made to the Loader will be to Read address 0, the start of a Chunk directory for the Code Space. Errors are returned in the usual way; V is set and R0 points at a word-aligned word containing the error number, which is followed by an optional error string, which in turn must be followed by a zero byte. ReadByte and WriteByte may be able to return errors like 'Bad address' if the device is not as big as the address given, or 'Bad write' if using read after write checks on the WriteByte call. If the CallLoader entry is not supported then don't return an error. If Reset fails then return an error. Since your device drivers may well be short of space, you can return an error with R0=0. The Expansion Card Manager will then supply a default message. Note that this is not encouraged, but is offered as a suggestion of last resort. Errors are returned to the caller by using ORRS pc, lr, #V_bit rather than the usual BICS exit. The bit masks are used to separate the fields of a combined hardware address - see the description of Podule_HardwareAddress for details of these. If the Expansion Card Manager is ever asked to 'EnumerateChunk' a Chunk containing a Loader, it will automatically load the Loader. Since RISC OS enumerates all Chunks from all expansion cards at a hard reset this is achieved by default. If no Loader is loaded then Podule_EnumerateChunks will terminate on the zero at the end of the Chunk Directory in the expansion card space. If, however, when the end of the expansion card space Chunk Directory is reached a Loader has been loaded, then a second Chunk Directory, stored in the Code Space, will appear as a continuation of the original Chunk Directory. This is transparent to the user. This second Chunk Directory is in exactly the same format as the original Chunk Directory. Addresses in the Code Space Chunk Directory refer to addresses in the Code Space. The Chunk Directory starts at address 0 of the Code Space (rather than address 16 as the one in expansion card Space does). Each of the four possible internal expansion card slots has four bytes of CMOS RAM reserved for it. These bytes can be used to store status information, configuration, and so on. You can find the base address of these four bytes by calling Podule_HardwareAddress or Podule_HardwareAddresses. None of the SWIs described in this chapter will act upon the system ROM. In the Arthur operating system, expansion cards were known as Podules. The word 'Podule' was used in all the names of SWIs and * Commands. These old names have been retained, so that software written to run under Arthur will still run under RISC OS. This call is made just before a software generated reset takes place, when the user releases Break. This gives a chance for expansion card software to reset its devices, as this type of reset does not actually cause a hardware reset signal to appear on the expansion card bus. This call must not be claimed. This call is issued by ADFS to enable ST506 hard disc expansion cards to intercept ADFS and use their own hardware rather than the hardware built into the machine. The expansion card should claim the service call, updating the passed registers to the values for its own hardware. This call is issued by ADFS to enable IDE hard disc expansion cards to intercept ADFS and use their own hardware rather than the hardware built into the machine. The expansion card should claim the service call, updating the passed registers to the values for its own hardware. This call is issued by an IDE expansion card module to warn ADFS of its imminent demise. This call reads into R0 a simple Expansion Card Identity, or the low byte of an extended Expansion Card Identity. It also resets the Loader - if one is present, and has been loaded. This call reads an extended Expansion Card Identity into the buffer pointed to by R2. If the IS bit is set (bit 1 of byte 1) then the expansion card also has Interrupt Status Pointers, and these are also read into the buffer. This call also resets the Loader - if one is present, and has been loaded. If you do not know whether the card has Interrupt Status Pointers, you should use a 16 byte buffer. Extension ROMs always have Interrupt Status Pointers (although they're always zero), so you should always use a 16 byte buffer for them. This call reads information about a chunk from the Chunk Directory. It returns its size and operating system identity byte. If the chunk is a module it also returns a pointer to a copy of its name; this is held in the Expansion Card Manager's private workspace and will not be valid after you have called the Manager again. If the chunk is a Loader, then RISC OS also loads it. To read information on all chunks you should set R0 to 0 and R3 to the correct ROM section. You should then repeatedly call this SWI until R0 is set to 0 on exit. RISC OS 2 automatically does this on a reset for all expansion cards; if there is a Loader it will be transparently loaded, and any chunks in the code space will also be enumerated. Later versions of RISC OS use Podule_EnumerateChunksWithInfo. This call reads the specified chunk from an expansion card. The buffer must be large enough to contain the chunk; you can use Podule_EnumerateChunks (see Podule_EnumerateChunks) to find the size of the chunk. This call reads bytes from within an expansion card's code space. It does so using repeated calls to offset 0 (read a byte) of its Loader. RISC OS must already have loaded the Loader; note that the kernel does this automatically on a reset when it enumerates all expansion cards' chunks. This command returns an error for extension ROMs, because they have neither code space nor a Loader. This call writes bytes to within an expansion card's code space. It does so using repeated calls to offset 4 (write a byte) of its Loader. RISC OS must already have loaded the Loader; note that the kernel does this automatically on a reset when it enumerates all expansion cards' chunks. This call enters an expansion card's Loader at offset 12. Registers R0 - R2 can be used to pass data. The action the Loader takes will vary from card to card, and you should consult your card's documentation for further details. If you are developing your own card, you can use this SWI as an entry point to add extra features to your Loader. You may use R0 - R2 to pass any data you like. For example, R0 could be used as a reason code, and R1 and R2 to pass data. In some hardware designs it may be important to share hardware between the Loader and the driver. You can do so by using this call to call the Loader, which can do hardware accesses for the driver and maintain its own state. For example, if your hardware has a 7 bit page register and a 1 bit output port shared within a single 8 bit latch, the Loader could maintain a flag for the state of the port, and write that bit correctly whenever it writes to the page register. This call reads bytes directly within an expansion card or extension ROM's address space. It is typically used to read from the registers of hardware devices on an expansion card, or to read successive bytes from an extension ROM. You should use Podule_ReadBytes to read from within an expansion card's code space. This call writes bytes directly within an expansion card's address space. It is typically used to write to the registers of hardware devices on an expansion card. You should use Podule_WriteBytes (see Podule_WriteBytes) to write within an expansion card's code space. Obviously you cannot write to an extension ROM. You must not use this call to try to write to the ROM area; if you do so, you risk reprogramming the memory and video controllers. You can use a mask to extract the relevant parts of the returned value. The CMOS address in the low 12 bits is suitable for passing directly to OS_Byte 161 and 162. In practice there is little point in finding the combined hardware address of an extension ROM. The base address of the extension ROM is of little use, as the width of the ROM can vary; and extension ROMs do not have CMOS RAM reserved for them. This call reads information about a chunk from the Chunk Directory. It returns its size and operating system identity byte. If the chunk is a module it also returns pointers to copies of its name and its help string, and its address if it is executable. These are held in the Expansion Card Manager's private workspace and will not be valid after you have called the Manager again. RISC OS automatically does this on a reset for all expansion cards; if there is a Loader it will be transparently loaded, and any chunks in the code space will also be enumerated. This call is not available in RISC OS 2, which uses Podule_EnumerateChunks instead. This call returns the number of expansion cards and extension ROMs. The number of expansion cards returned is currently always 4, but you must be prepared to handle any other value, including 0. This call is used by the *Podules command. *PoduleLoad copies the contents of a file into an installed expansion card's RAM, starting at the specified offset. If no offset is given, then a default value of 0 is used. *Podules displays a list of the installed expansion cards and extension ROMs, using the description that each one holds internally. Some expansion cards and/or extension ROMs - such as one that is still being designed - will not have a description; in this case, an identification number is displayed. This command still refers to expansion cards as podules, to maintain compatibility with earlier operating systems. This command does not show extension ROMs under RISC OS 2. *PoduleSave copies the given number of bytes of an installed expansion card's ROM into a file. If no offset is given, then a default value of 0 is used. 40 PRINT"Joiner for expansion card ROMs"'"Version 1.05." 340 IF K% ELSE PRINT"No more room." 1160 PRINT"Changing up. Wasting ";Top%-Bot%;" bytes."